Anime director Mamoru Oshii (Ghost in the Shell, Patlabor, Blood the Last Vampire, Jin-Roh: The Wolf Brigade) has been off the radar for quite some time. On Friday night, December 12th, the Lincoln Center of NYC became the only place in the country to check out his newest piece, The Sky Crawlers. 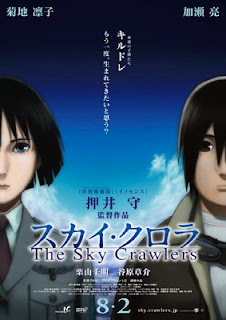 Based on a novel series by MORI Hiroshi, Sky Crawlers is a story of perseverance and the banality of an existence centered on combat. There is a war, a struggle between two nations happening in the skies above us - but it's not our problem. Yuichi Kannami is a top fighter pilot who has just transferred to a new base. New plane, new missions, new crew to meet. And, like every other pilot there, he is a Kildren: an immortal "child" who will never grow up. These genetically-engineered living dolls trudge through their day-to-day routines, repeating tasks and only feeling the thrill of life while fighting in the skies. Peter Pan references set aside, this movie drags at the pace of a coma. Harold Pinter himself would admit the film's minimalistic approach is a bit too slow. Even the dog-fight scenes between the fighter planes seems to lack immediacy and drive. On top of that, Tetsuya Nishio's (Naruto, Jin-Roh) symmetric and almost flat character design gives little complexity to the film's aesthetic. The coloration is bland, holding an almost salt-worn quality, which only drives Oshii's point home about how dull a Kildren's life is. Without the aerial combat, this film could have been made live-action in the 1960's and no one would have known the difference. On the big screen, the fighter plane sequences are dazzling. The sharpness of the 3D is so well done, it's easy to forget you're watching an anime. Every bullet shot tears across the screen, and for the first time, bullet-time meets air planes: Max Payne would be pleased. Yet, pacing set aside, Oshii has created a fascinating proposal: a world that uses a never-ending war as a means of keeping the peace. The lackluster nature of the immortal Kildren only smooths out their passion and personal drives, keeping them willing to fight. As the story progresses, Yuichi becomes close with his mysterious captain, Kusanagi, and the two develop a strange cat-and-mouse/friendly fire relationship as they delve into the others' past secrets. All of their questions and searching lead back to their mission: to fly until shot down, until confronted by the mysterious and untouchable Teacher. Subtext and subtlety are more important to this film than the amazing plane fights. The bare minimum script leaves small clues in an almost "Memento" style, that does not need to be pieced together in order to follow the film. What matters in the symbolism. The children cannot surpass the Teacher, the "father" figure who taunts them silently from above. The Kildren's lack of drive for life causes them to shut down their hearts, blur their memories, and live half-consciously just to stave off their immortal boredom. If only they'd take the cues from every vampire story every written: IMMORTALITY IS BORING. This film could only be made by Mamoru Oshii: cryptic, distant and profound. Once again, he has crafted a piece that provokes serious analysis and discussion rather than cosplaying fangirls.